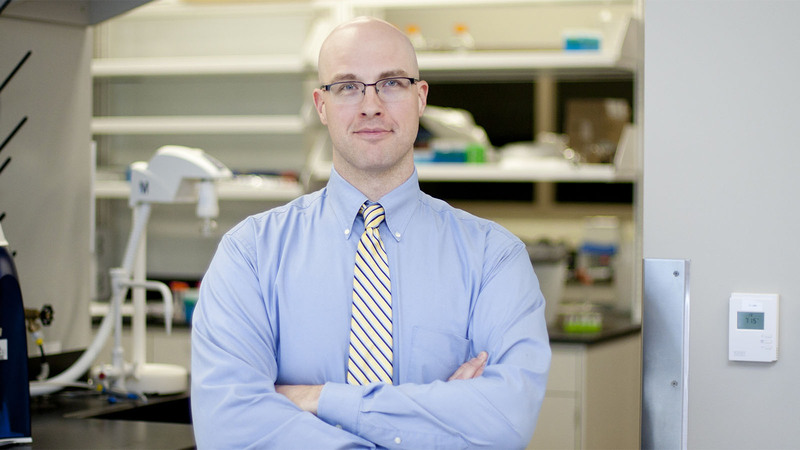 Adam Hall, PhD, integrates biomedical engineering expertise with the study of solid-state nanopores, single-molecule detection and characterization and DNA-protein interactions to create disease screening nanotechnologies. He seeks licensing partners for his medical technologies, including a diagnostic for diseases of molecular origin, an assay for detecting and quantifying target nucleic acid sequences and microfluidic devices. Adam Hall earned a doctorate in applied and materials sciences in 2007 from the University of North Carolina at Chapel Hill, where his interest and fascination with nanotechnology began. He spent three years as a postdoctoral researcher at the Delft University of Technology in the Netherlands, studying single-molecule biophysics and performing experiments on solid-state nanopores. In 2010, Hall became an assistant professor of nanoscience at the Joint School of Nanoscience and Nanoengineering before joining the Virginia Tech-Wake Forest School of Biomedical Engineering and Sciences in 2013. In his research, Hall uses solid-state nanopores to create genetic and epigenetic screening devices for DNA sequencing and disease biomarker detection. Specifically, he develops nanotechnology devices as diagnostic tools for cancer, Alzheimer’s disease, dementia and other diseases of molecular origin. He also developed a novel assay for detecting and quantifying target nucleic acid sequences. By selectively extracting molecules, these technologies have the capability to distinguish bioindicators of disease initiation and progression. Working with the Wake Forest Institute for Regenerative Medicine, Hall further explores the mechanisms of various diseases. He creates microfluidic devices in order to examine how small, artificial organoids, or groups of cells, initiate disease and respond to treatment. His current studies focus on liver organoids with more complicated structures under development. Hall collaborates with industry to advance nanotechnology-based medical applications and explore the root cause of various diseases. He works with partners worldwide on device development, testing and analysis with the goal of identifying new biomedical applications that will improve disease prevention, management and treatment.